MSO hosted a wonderful stroll down music theatre memory lane with a highly talented assemblage of musicians. 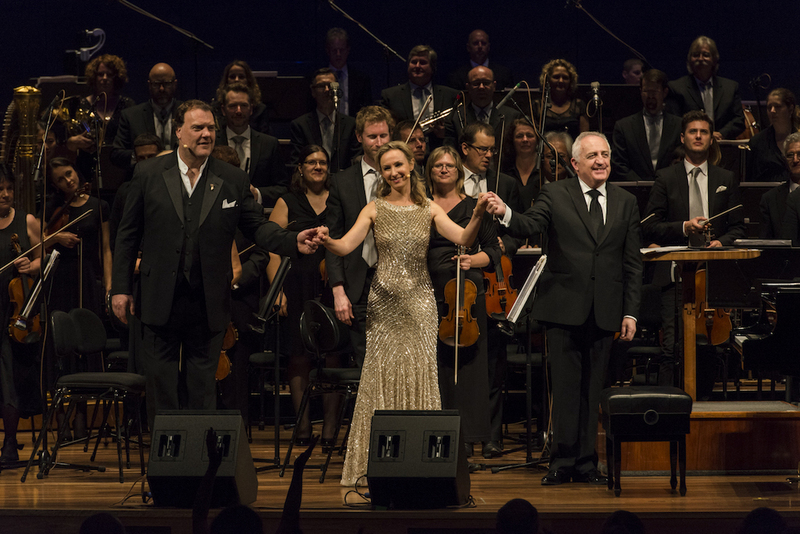 On the beautiful Melbourne afternoon, acclaimed Welsh baritone started the show with “Oh What A Beautiful Morning.” Terfel previewed his upcoming role as Tevye in Fiddler on The Roof with the epic ballad “If I Were A Rich Man.” From the outset, a hallmark of Terfel’s style was his relaxed, amiable stage manner. It was clear that he was extremely well rehearsed, knowing the songs inside out, yet he made each number seem spontaneous and fresh, as if not only the sentiments of the lyrics but also the dynamics and tempo of the music were just occurring to him as he went along. The audience was able to relax and enjoy the gorgeous music, knowing they were in extremely capable hands. Speaking of capable hands, waving the baton with supreme assurity was maestro Bramwell Tovey, a sterling musician and a genial host for the afternoon. Lisa McCune recreated some of her greatest stage hits, singing Sarah’s “If I Were A Bell” from Guys and Dolls and Nellie’s “Wonderful Guy” from South Pacific. “I Have Confidence,” from the movie of The Sound of Music, was also included. While McCune’s voice is a little slight compared to Terfel’s mighty power, her soprano is nonetheless exactly the sort of voice for which these songs were written, and her sunny charm shone through. Tovey accompanied McCune on grand piano for a swinging version of “If I Were A Bell” as well as the Gershwin’s “Summertime,” in which he played a delightful, jazz-infused interlude. Given that the majority of selections were from the Golden Age of Broadway, it was a thrill to hear “Wheels of A Dream” from Ahrens & Flaherty’s Ragtime. This soaring duet closed act one, and was the first time Terfel and McCune sang together. One of the real thrills of the concert was the opportunity to hear these classics with an orchestral accompaniment far beyond even the most generous Broadway standard. The musicians showed themselves to be great sports, shouting “Mambo!” during Bernstein’s thrilling overture for West Side Story. The “Carousel Waltz” sounded absolutely superb. Act two opened with lesser-known Richard Rodgers piece “Slaughter on Tenth Avenue”, the ballet from On Your Toes, a revelation of rich melodies. In the second half, McCune sang “Show Me,” a song written for My Fair Lady’s Eliza Doolittle (one of the few great soprano roles that McCune has not played). Tovey showed a fine way to treat a Steinway as McCune sang Irving Berlin’s “I Love A Piano” with girlish glee. 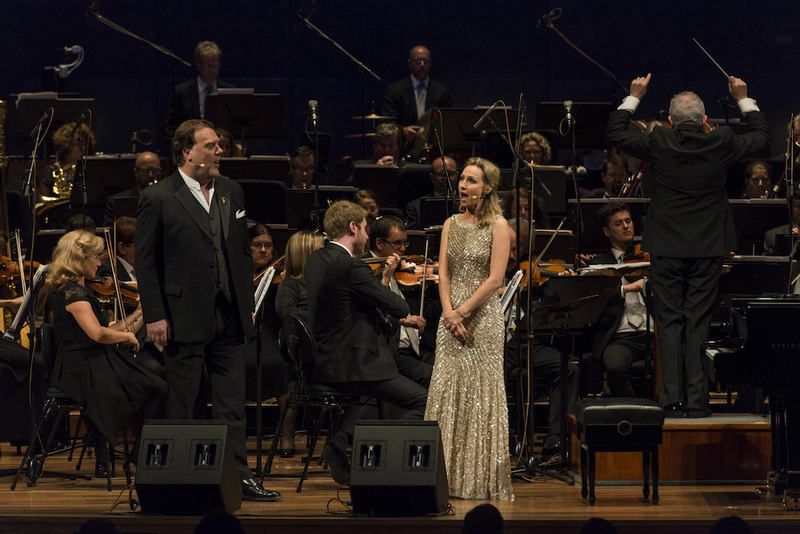 Bryn Terfel and Lisa McCune Sing Broadway Classics was reviewed at Hamer Hall at 2pm Sunday 15 March 2015. MSO presents Bryn Terfel in Berlioz’s The Damnation of Faust at Hamer Hall on 20-21 March 2015. It was a truly memorable afternoon. Terfel’s pianissimo in the last line of “Some Enchanted Evening” was exquisite. Glad you were able to be there as well Fiona. Thanks for your comment. Terfel’s control over his vocal dynamics was quite extraordinary. And what a charming man. Cannot wait for Damnation of Faust next weekend.